1. Aston Martin IPO: Aston Martin is joining the ranks of listed automakers with an IPO that values the British company at more than $5 billion. The favorite carmaker of fictional British secret service agent James Bond has priced its shares at £19.00 ($24.70), giving it a valuation of £4.3 billion ($5.6 billion). The final share price is 16% below the top of the range that Aston Martin had targeted, reflecting investor doubts about whether the carmaker should be valued in the same league as Italian rival Ferrari. In going public, the British company is also asking investors to overcome fears about US threats to tax foreign autos and the potential for Britain's planned exit from the European Union to disrupt supply chains and markets. Shares dropped as much as 6.6% in early London trading on Wednesday. 2. Italian relief: Italian bonds have recovered some ground after Italian media reported that the country's government is close to agreeing a budget with smaller deficits than feared. The euro strengthened 0.3% against the US dollar and the main stock market in Milan gained over 1%. Italian bonds have suffered in recent months as the populist government appeared ready to clash with the European Commission over plans to increase public borrowing. Still, that doesn't mean investors can rest easy. Analysts at Capital Economics warn that a prolonged period of higher bond yields still poses a risk to the country's banks. "In that case, banks would probably have more trouble funding themselves in wholesale markets," the analysts wrote Wednesday. "And the current government seems much less likely to step in and help struggling lenders than previous administrations." 3. Global market overview: US stock futures were edging higher. European markets opened up, while stocks in Asia were lower. The Shanghai Composite was closed for a holiday. The Dow Jones industrial average added 0.5% on Tuesday. 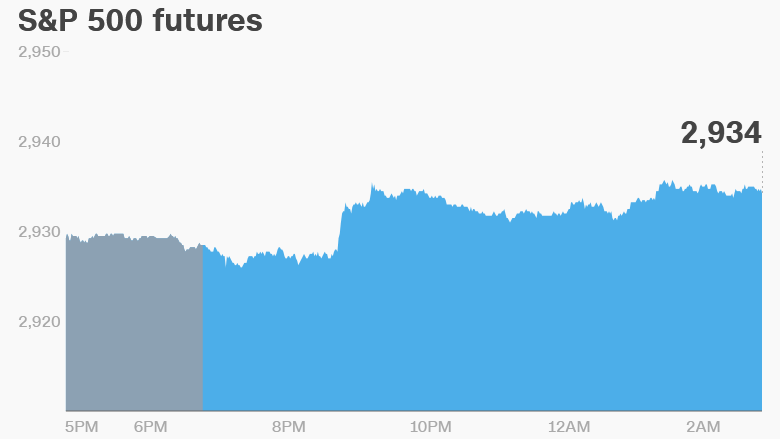 The S&P 500 was flat and the Nasdaq shed 0.5%. 4. Earnings and economics: Lennar (LEN) will release earnings before the open. Pier 1 Imports (PIR) will follow after the close. A report on crude inventories is set to be released 10:30 a.m. ET. Shares in Tesco (TSCDF) dropped 5% in London after the UK supermarket chain reported earnings that disappointed investors. The mega retailer launched a new discount chain last month, called Jack, that could help it fend off competition from German discounters. Turkish inflation reached 24.5% in September, according to new data. The lira slipped 1% against the dollar.